“Eat Right, Your Way, Every Day” is the theme for National Nutrition Month 2013. The Academy of Nutrition and Dietetics (formerly The American Dietetic Association) created National Nutrition Month to increase nutrition awareness. This year's theme encourages personalized healthy eating styles, recognizing the many factors that influence individual choices. Food allergies are a big factor that influences daily choices. Recent studies have demonstrated that children who have food allergies were found to be smaller than other children and those who were allergic to more than two foods were smaller than children who were only allergic to one or two foods. When you restrict two or more important foods, it is more difficult to obtain nutrients necessary for growth and development. Therefore, making sure your child's nutritional needs are met through a balanced diet is essential. Parents of food allergic children should be prepared to discuss their child's food intake at each visit with the allergist. In preparation for the visit, keep a food diary for a few days. A food diary is a simple journal where you write down everything your child eats on a notepad. A food diary will help your child's allergist determine if important nutrients are missing from your child's diet or if you need a referral for a nutritional consultation from a registered dietitian. Healthcare providers who specialize in food allergy treatment provide guidance on foods to avoid or include when food allergies are present. You should only make dietary changes as indicated on the allergy treatment plan prescribed by your child's health care team. When your child has food allergies, you will need to carefully read labels to make sure there are no allergens in the foods your child will eat for each meal and snacks. Also, pay additional attention to the nutrition labels to make sure you include important nutrients in your child's diet when you are avoiding allergens. The overall pattern of foods eaten becomes an important focus for a daily, healthy diet. It is not important to make sure that each meal is balanced, but rather, that you add a variety of foods during the day to balance out a child's diet. You should check labels for allergens, even if your child has eaten the food safely in the past. Food manufacturers frequently change ingredients, so the best way to avoid allergens is to read the label every time your child is going to consume the food. First of all, focus on all the foods your child can eat by making food lists. 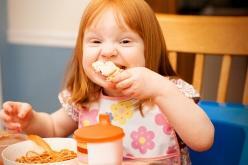 Usually, it's amazing to see how many foods your child can eat when you use this approach. Separate the foods listed into meals (breakfast, lunch, dinner, snacks), then into food groups. At each meal, choose a food from each group to obtain a good balance of nutrients. Highlight favorite foods with a colored highlighter marker on your list. Add some unusual foods or foods from other countries to the list for more variety. Your whole family can participate in the favorite food activity by printing initials next to favorite foods instead of highlighting them. Check the pantry and refrigerator to see how many of the “can eat” and “favorite foods” are in your house. Make a shopping list for foods so all of the foods for each meal are available to achieve a good balance in the diet. Decide which of the important nutrients may be missing in your child's diet due to an allergy and find an alternate source. The following information may help. So, you can see from the chart if you avoid only one food due to an allergy, other foods can provide the same nutrients. Milk’s biggest nutrient is calcium, so unless a fortified substitute is carefully chosen, calcium may be the most difficult nutrient to replace for young, growing bodies. In that case, it may be necessary for you to discuss calcium supplements with the allergist or dietitian. As the awareness of food allergies has increased over the years, so has the number of food companies producing allergen free foods. It is much easier now to choose foods to ensure adequate nutrition than even five years ago. When you choose foods, you will need to take time to read the labels and nutrition panels as well to learn as much as possible about the foods that are okay to include in your child’s diet. Once you follow these tips to learn about choosing nutritious foods, it will be easy to “Eat Right, Your Way, Every Day”, even when your child has food allergies. 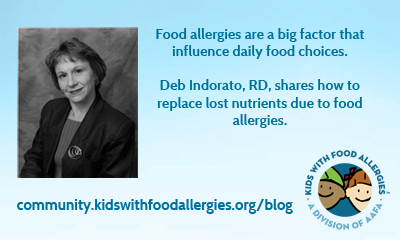 Deb Indorato, RD, has served as nutrition advisor on the medical advisory team of Kids With Food Allergies Foundation since we began in 2005. 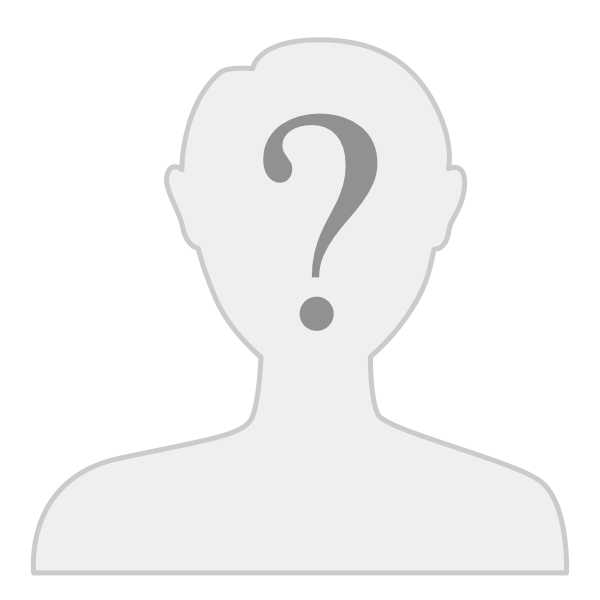 She has a special interest in food allergies and consults with medical practices and businesses to educate staff on food allergies. She provides food allergy education for individuals and groups. 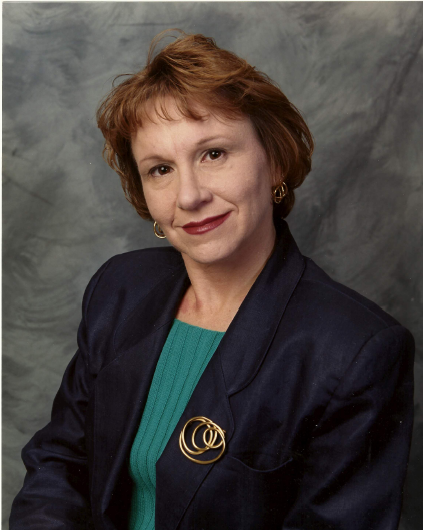 She is also an allied health member of American Academy of Allergy Asthma and Immunology, and has served on its Adverse Reactions to Foods Committee. Thank you for this article! I've always suspected that my 8 year old son's food allergy to dairy, eggs and nuts had something to do with his small size and this article helped affirm my suspicions. I've often been told by family that I'm a "helicopter mom" when it comes to making sure he eats and eats good. I do it because I know he has to make up with foods that will give him the equivalent or if not similar nutrients from foods he's allergic to. And with his high metabolism, it doesn't make it any easier. He started consuming baked foods containing eggs and milk last year and it's amazing to see how much easier it is for him to gain weight, even if it's just a pound or two. I will definitely share this article with my family. Hopefully, they'll understand why I do what I do. Does "smaller" refer to height, weight, or both? I'm wondering how much of the size difference has to do with nutritional deficiencies vs. an overall awareness of our diets. Because we read every label, every time, we notice not only allergen-containing foods, but also artificial colors, flavors, and sweeteners. Our kids eat a lot less junk food than average American kids, and we eat out a lot less too (restaurant food tends to be higher in fat and sodium than home-cooked food). That combined with an active lifestyle... of course our kids aren't the biggest in the class! can your son have garbanzo beans? you can make bread with it. can your son have coconut milk? Good subs for milk. great article thank you.quick question. Most of the bread and cereals are fortified with folic acid. I just started to make my own bread since its hard and expensive to buy gluten free bread that has no soy and corn. Could I add folic acid to the bread I make myself? I agree with the suggestions made for you to post on the EOS forum. You are not alone and there are many parents in the group who may be able to provide support and share their experiences. I am hoping the dietitian you are seeing has a significant level of experience with children who have not only food allergies, but experience with more challenging cases such as eosinophilic disorders. Formulas definitely are useful in meeting nutritional needs as well as giving the digestive tract a rest, allowing for healing. It might be difficult for your son to adapt to a formula and you may need to start slowly. Discuss formula options with your son's allergist who may have some samples in the office you could try. You may want your son to help you make a list of what he will eat or what he feels OK eating and work with those foods. He may be afraid to eat and therefore refusing foods. Through KWFA there are many resources and recipes that may be helpful once you identify what is ok for him to eat. Please do not hesitate to post your questions. Excellent article! As a fellow dietitian and mother of a child with a severe food allergy, the advice in this article offers a great deal of practical and beneficial information! Thanks for sharing your expertise! Welcome Rosangela! We are glad you found us. Is your son on any type of formula? A formula can take the guess work out of the nutritional side of things. I know we have some members with older children that are drinking Neocate, Elecare or E028 juice box type drinks. welcome. . You may want to check out our eos forum for some ideas. Thank you so much for this article. I have a son who is 9 years old and has EOE. He's allergic to almost all fruits and vegetables, nuts, barley, soy, corn, potatoes, rye, etc. He does not eat any kind of meats, fish, poultry. He got so tired of rice that now he can't even see it. Now the doctors decided that he should not eat anything that has wheat, milk and eggs on it because they believe that's what is making the disease worse. What should I do? I'm seeing a dietitian and everything she tells me to try with him he won't eat. I do not know what to feed my son anymore and I'm really worried about all the nutrition he is not getting. I tried Quinoa and that did not go well with him. What else can you suggest? Thank you so much.